Who wouldn’t want a piece of moist cake drizzled with the delicious cream cheese glaze? Although I am enjoying the beautiful warm weather in southern hemisphere. I miss seeing the neighborhoods lined with maple trees, and the houses decorated with pumpkins and fall leaves. I have been craving the flavor of fall. Pumpkin is one of them. I purchased a dozen cans of organic pumpkin puree and I had to make something that can satisfy my fall craving. 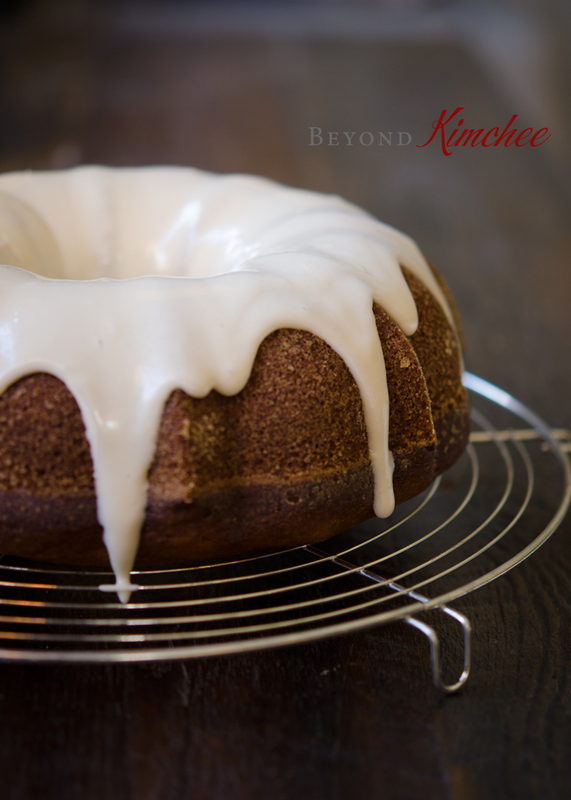 This pumpkin bundt cake is one of the best pumpkin cake I’ve made. No doubt! It is moist and has just right amount of spice that is not too strong nor too weak. You can still taste pumpkin in the cake. The addition of maple syrup in the glaze is perfect to match the pumpkin, too. No matter how good the outcome of the dish looks, if the recipe seems too complicated, I probably won’t have a desire to give it a try. The good news is that this recipe is very simple to put together. You don’t even need a mixer. 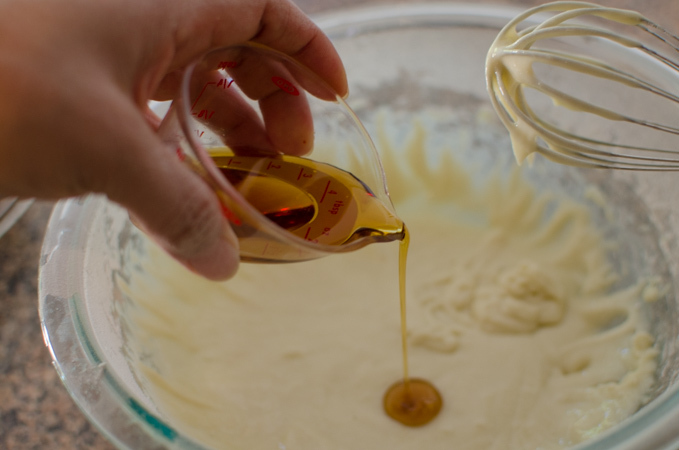 Just a couple of mixing bowls and a whisk is all you need. Combine the dry ingredients in a bowl. The ratio of the spices is just right for me, but you can easily adapt the each amount to your preference. Combine the wet ingredients. Oil makes this cake incredibly moist. Use any kind of non-fragrant oil such as canola, corn, or sunflower seeds oil. Bake the cake in a greased and floured bunt pan. You can also bake this cake in 9×13 inch pan as well. Just adjust the baking time accordingly. You want to cool this cake completely before drizzling the glaze on top. All you need for the glaze is cream cheese, powdered sugar and maple syrup. You can adjust the amount of maple syrup for your desired consistency, thick or thin! I wanted to wait but I had to cut a slice to indulge myself before everyone comes back home from school and work. Ahhhh… the love at first bite! I can almost taste the fall of Virginia where I used to live. Everyone in my family raved for this cake. I have to make another one for my husband to take to work. It is so easy and quick to put together, I don’t mind baking this cake two days in a row. Hope you are having abundant pumpkins this season and share the tasty goodness with your loved ones! Preheat the oven to 350˚F. Grease and flour the bundt pan. 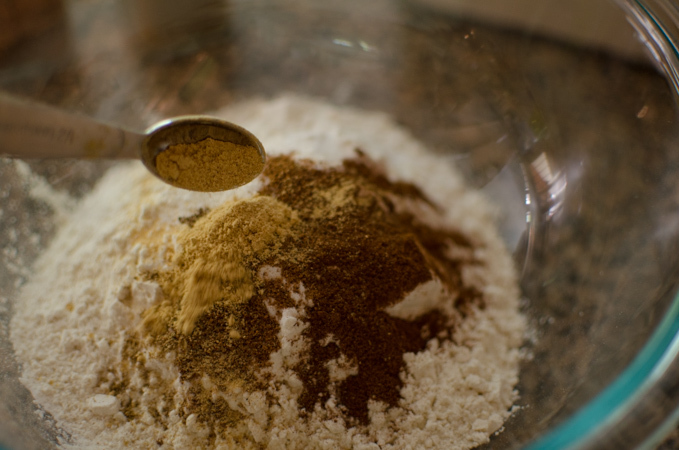 In a bowl combine flour, baking soda, salt, and the spices. Whisk well and set aside. 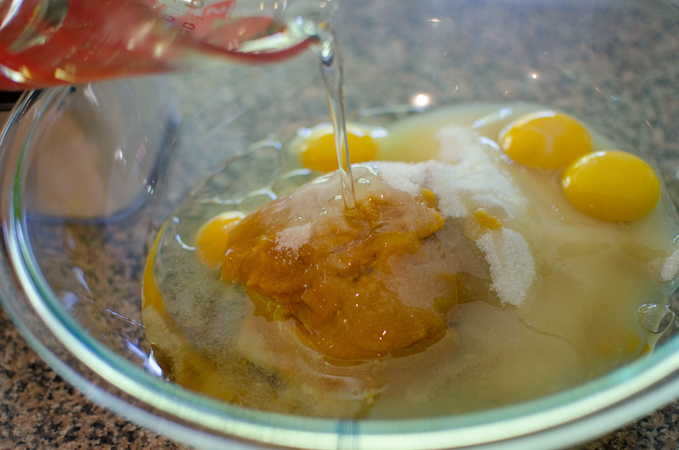 In another large mixing bowl, combine pumpkin, sugar, eggs, and oil. Whisk well until smooth. Gradually add the flour mixture to the pumpkin mixture until blended. 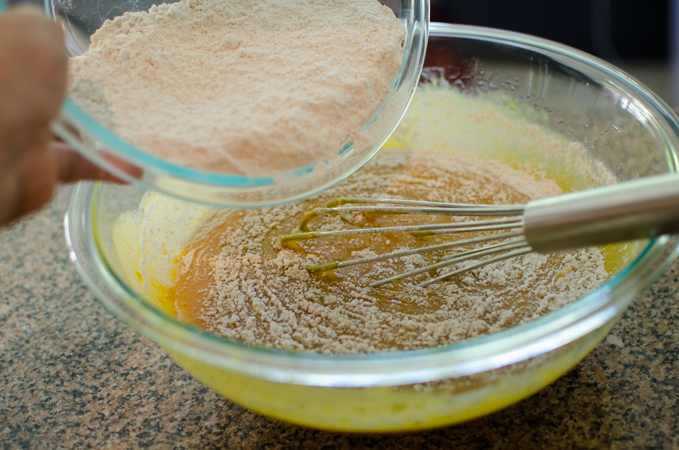 Transfer batter to the prepared bundt pan. Bake 50-55 minutes or until a toothpick inserted in the center comes out clean. Cool in pan for 15 minutes before removing to a wire rack to cool completely. For the glaze, beat cream cheese and 3 tablespoon of maple syrup, Slowly add the powdered sugar until smooth. Add the milk if needed. Adjust the amount of maple syrup for your preferred consistency. Wow! This is gorgeous. 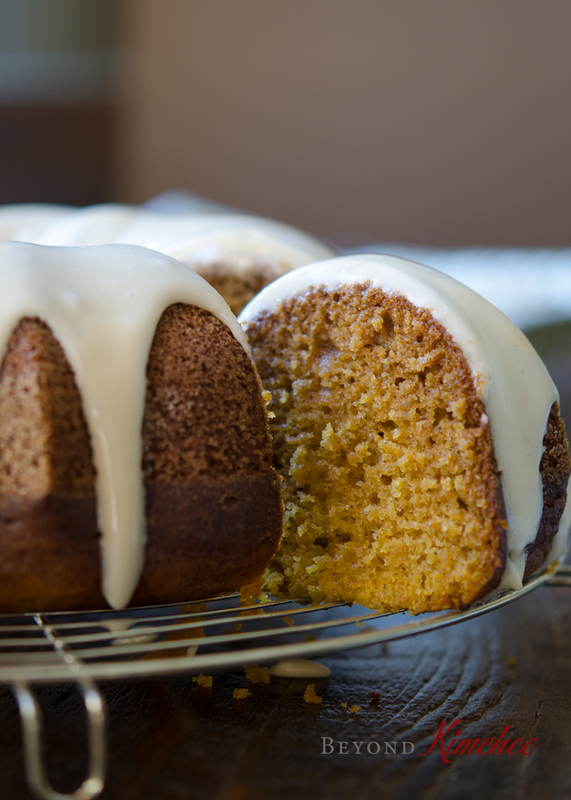 Never had a pumpkin bundt cake, but love the idea. And maple glaze is wonderful! 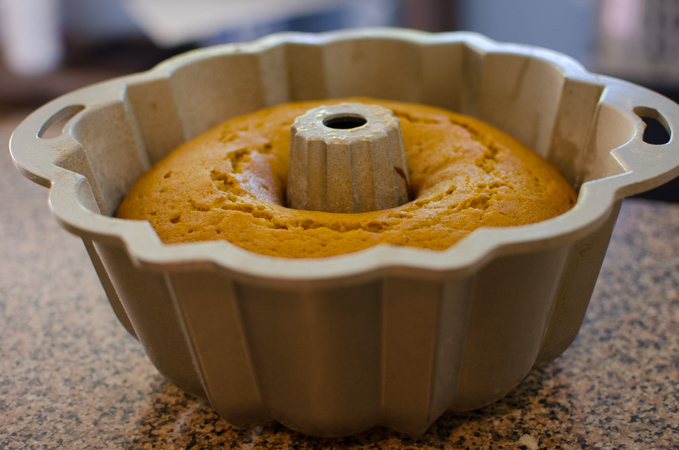 I have been meaning to make a pumpkin bundt this season, but haven`t the chance! This is making me regret my decision. It looks fabulous. Love that glaze. You better hurry before the pumpkin season is over! Can't go wrong with any baking with pumpkins! The maple cream cheese glaze sounds so dreamy! Cream cheese and pumpkin go great together - this is a great dessert for Thanksgiving time! 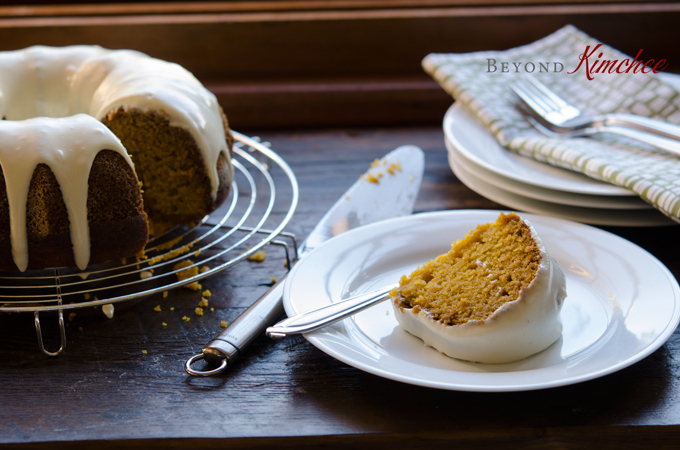 Craving a slice of this pumpkin bundt cake right now, it looks SO good. Especially with all that cream cheese and maple glaze! I love my bundt pan. You can a lot of baking with it! Get it soon! I made this last night for my husbands birthday and he love love loved it, as did I! I used fresh pumpkin, and sprinkled toasted chopped pecans on top after icing. So so good. Thank you for your recipe. Hi Ree That is just so wonderful! My husband loves this cake and so did everyone else in the family. So simple to make and so delicious! Perfect fall dessert, isn't it? I baked it once on the day you posted it and baking it again today ,that says how much we loved it. Wonderful! I made this cake twice in one week, too. My husband took it to work and his coworkers loved it very much. There were many other baked goods as well and he came home with a empty platter. This cake looks amazing and it would be perfect for Thanksgiving! I love fall, but this snow that's falling outside has made it clear that winter has arrived. I can't wait to make this and pretend that the leaves are still changing colors. It is so interesting to see how big this earth is that people can have a completely different weather depends on where they live. It is getting hot where I live and I am enjoying the good weather. 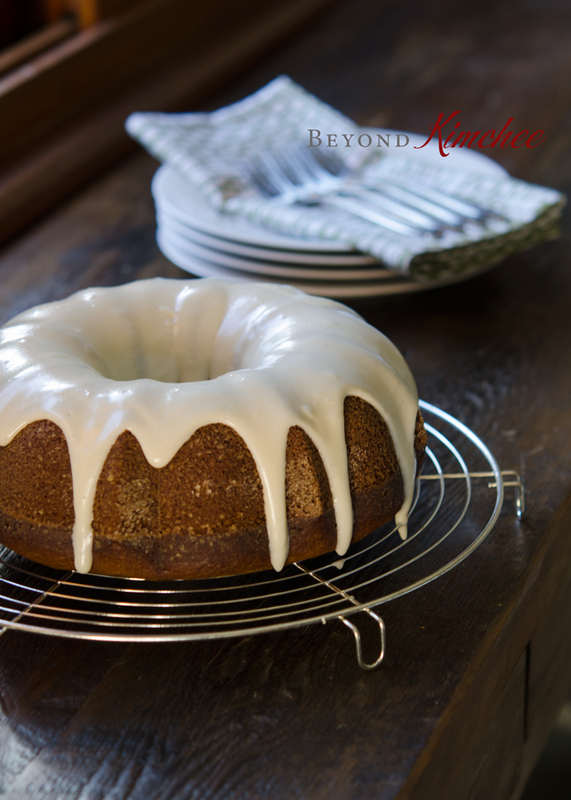 This pumpkin bunt cake is absolutely delicious and one of the cakes that please the crowds in the party. Hope you can give it a try. You will like it. Just made this glaze for a pecan maple bundt cake! Does this glaze need to be refrigerated? Not necessarily. I kept the cake with the glaze on the counter for 2 days and it was fine. Hi - for the glaze, is it 1 - 1/2 cups powdered sugar? Typo above and wanted to be sure. Thanks! Yes, it is 1-1/2 cups. Thanks for pointing out. Thanks! I made the cake yesterday and it turned out great! I made a pumpkin spice cake from a cake mix recipe (out of laziness/lack of time). I used your frosting recipe to top it. The frosting was delicious and took the cake over the top. Thank you!